I am known to be a sensitive person. Stop laughing honey. I can see you from here. Where was I again? Oh yes, the sensitive part of me. I am a very sensitive person: I am the kind of person who will cry hours after the generic of a movie, the kind of person who won’t kill a spider because it’s just wrong, but will most definitely kill a cockroach. I am the kind of person who will feel really bad when I forget watering my plants or when I, unintentionally, hurt somebody else’s feeling. I am the kind of person who will collect park tickets and dried roses as memories, and the kind of person who can’t stop cooking again and again her latest crush. Even if it is as simple as a carrot dish. I had this idea of a savory tart Tatin, instead of the traditional apple Tatin, after I saw some cute cherry tomatoes tartlets Tatin. Instead of using tomatoes, I decided to use carrots because I can’t have enough of caramelized carrots with herbs. I usually use sage with my carrots but this time I went with thyme as I wanted a more woody and rustic flair to my tart. The tart can be made in individual sizes and served as little appetizers. 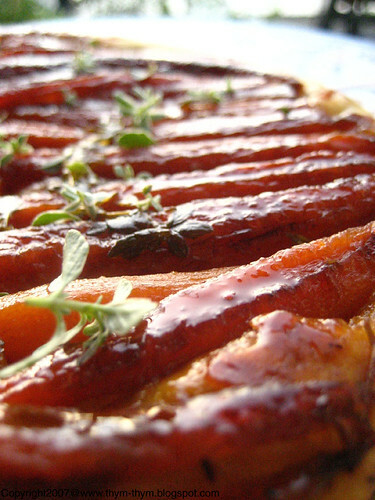 Now, what’s so special about caramelized carrots on a crust? Nothing, in fact.just the beauty of a simple dish that doesn’t need a lot of skills or time to make and which happened to be my latest discovery and my shameless sweet crush. Make the pastry crust and let it chill until needed. In the meantime, melt 1 tsp butter with 1 tsp vegetable oil in a cast iron pan. Put the carrots in a pan. Season with salt and pepper and let them cook covered on medium heat. Uncover the pan and flip the carrots when they become tender. Let them cook this time uncovered. When cooked through, transfer the carrots to a cutting board and split them in half. Set aside. Roll out the pastry crust and cut a circle a little bigger than the size of your pan. Freeze the rest of the crust for another time. Put three sprigs of thyme in the pan and add the brown sugar on top. Cook on medium low heat just until the sugar starts to melt. Put the carrots back to the pan. Cover the carrots with the crust disc and tuck on the sides. Let it cook, again on medium-low heat for 5 min then put in a 350F until golden brown on top, about 15 to 20 min. Let it cool in the pan for 10 min then invert to a plate. Sprinkle with the remaining thyme leaves and serve, as a suggestion, with a peppery salad, such as escarole or endive. Faites votre pâte et mettre au frais jusqu’a utilization. Entre temps, dans une poele, antiadhesive, allant au four, faites fondre 1 c.c de beurre avec 1 c.c d’huile vegetale. Versez les carottes dans la poele. Assaisonnez de sel, poivre et laisser cuire couverts sur feu doux. Decouvrir la poele et retourner es carottes quand ils commencent a cuire d’un côté. Laisser cuire sans couvercle. Quand les carottes sont cuites, transvaser les carottes vers votre planche de travail et les couper en deux. Mettre de côté. Faites sortir la pâte et l’etaler sur une surface legerment farine. Couper un disc de la pâte avec un diameter un peu plus grand que celui de votre poele. Congeler le reste de pâte pour une autre utilisation. Remettre votre poele sur feu tres doux et mettre dedans trois brins de thym, puis le sucre brun. Laisser sur feu jusqu’a ce que le sucre commence a peine a fondre. Remettre les carottes dans la poele. Couvrir les carottes du disc de pâte en faisant en sorte de bien la faire rentrer sur les bords. Laisser cuire 5 min puis continuer sa cuisson dans un four prechauffe a 180C pendant 15- 20min ou jusqu’a ce que la pâte devienne doré. Soritr du four et laisser refroidir dans la poele 10 min puis invertir dans une assiette. Servir avec une salade de frisée ou d’endives. I would have never thought to do carrots on a tart. This looks amazing! Wow you have been cooking up a storm, I have been feeling a little challenged in the kitchen these last few, very hot, days (weeks). I am starting to feel guilty, nut just to my blog but to my family as well. I'm crazy about carrots too, Rose! Your tart is absolutely mouthwatering! 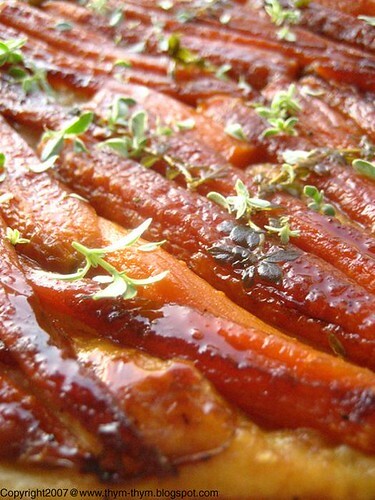 I would never think of doing a carrot tart, but the idea sounds lovely. Wow. I've never come across a carrot tart before. And I do love my carrots! Great idea. Most of the time I'm not a cooked carrot person -- I love raw carrots, but avoid cooked ones. But I am utterly seduced by these photos, and this recipe, and now I must try this tart! 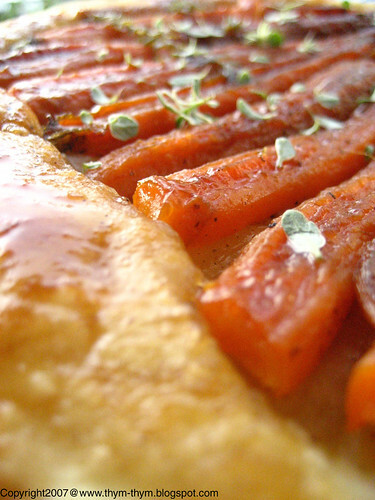 Carrots are our all time faves and adding them to a tart is such an awesome idea, Rose. I love it! I have found you via Serious Eats when you commented on my "dunking" post. Plan to read thru your archives! This sounds like a fabulous idea and your tart looks simply delicious! I've never been so tempted by carrots! - Oh Shayne. You don't have to feel guilty, I am the weirdo one who bakes at 90F. - Patricia,it's funny that you mentionned it because I have the same thing with carrots. I am glad you like it my friend. - Nora, I know how much you love cute little carrots and onions. In fact, I thought about you while making this tart. For the pan, I was lucky with my pan.It was on sale for $2. Cheaper than dirt, like the vendor told me. - Jerry, it is very good and so sweet, you would think you're having dessert. - Thank you very much Wendy. - Lydia, I don't like carrots when they are over-cooked, especially boiled, but this dish is so flavorful that you will love it. I guarantee it. - Anh, you are so sweet. Thank you very much for your nice words. - My dear Meeta, thank you very much. You should really try it. Your little one will love it. - Merci beacoup Marion de ta visite et de ce gentil mot. Mais je dois te contredire sur une chose c'est que tes photos sont aussi allechante, surtout tes aubergines a la Sophie. - JEP, so you are the one behind the post. I couldn't resist to comment as you could have noticed, dunking is a family affair. Thank you for your visit. I hope you will enjoy the ride through my archives. - Truffle, you are too kind. I am so glad you like it. I have never been a fan of raw carrots but myohmy do I love 'em cooked. This recipe sounds heavenly and I will be trying it soon! Thanks for the great idea! A tarte tatin with carrots, huh? Looks neat AND yummy! - Thank you so much Photogirl for your nice words.Hope you will enjoy this tart. - Thank you Na., We really enjoyed it. oooh boy do i love carrots sweetened with brown sugar. and lord knows i love dishes with a crust. i am really going to have to make this very very soon!